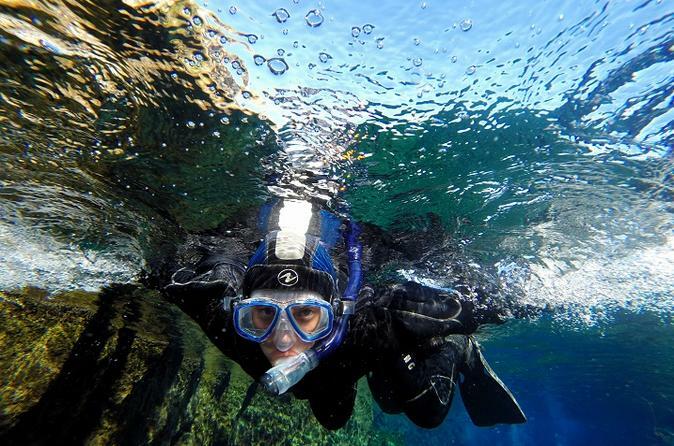 Snorkel in the crystal-clear glacial waters of the Silfra fissure in Thingvellir National Park on this 4-hour experience from Reykjavik. Don the supplied snorkeling gear and swim between the continental plates submerged in the fissure. Admire the multicolored rocks and water clarity, and follow your guide to swim around Silfra’s highlights. Post-snorkel hot chocolate, cookies and entrance fees are included. Your snorkeling destination is Silfra, an underwater ravine near Lake Thingvallavtan, located inside UNESCO-listed Thingvellir. This freshwater gorge is formed from a crack in the Earth’s crust where the world's continental Eurasian and North American tectonic plates lie a short distance apart. The ravine water is estimated to be 1,000-year-old glacial water from Iceland’s second-biggest glacier, Langjökull, and takes about 30 years to filter through the lava rock, making it incredibly clear. On arrival at Silfra, change into the provided warm undergarment and drysuit. Next, don the supplied face mask, snorkel, and fins, and listen to a comprehensive safety briefing and instructions. Then, with a guide showing the way, descend into the crystal-clear waters for a 30- to 40-minute expedition. Admire the electric blues of the water and multicolored rock formations, and follow your guide through the four main areas. 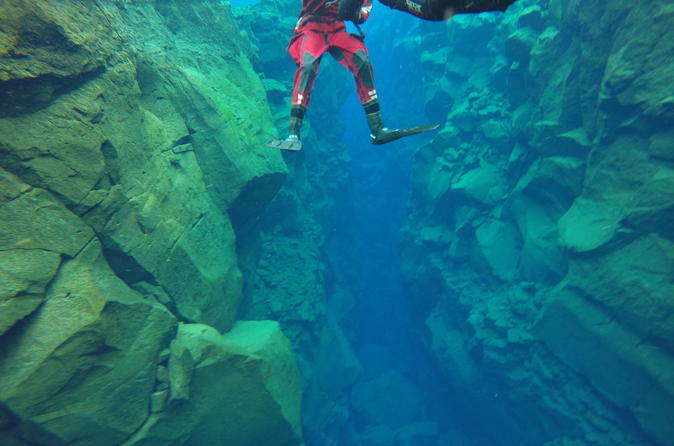 Swim through the Silfra Big Crack where the continental plates almost touch each other, and soak in the majesty of Silfra Cathedral, Hall, and Lagoon. The water clarity is such that visibility can extend to 328 to 492 feet (100 to 150 meters). Your guide will take photos on route that will be available for downloading free of charge after your tour. When it’s time, leave the water, change back into your everyday clothes, and savor hot chocolate and cookies. Your tour then concludes either when you leave Silfra independently, or enjoy a return transfer and drop-off at the original start point in Reykjavik.